"Printed in USA on highest quality, heavy weight card stock"
"Firefighter party supplies featuring firetrucks, fire hats and dalmatians." 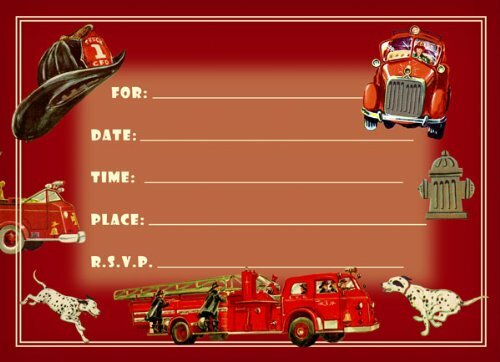 Vintage-inspired With firetrucks, fire hats and even Dalmatians, these cute vintage-inspired firefighter invitation cards are certain to start a blaze. Special birthday party invites for firemen young and old. Card quality We use 125 lb. Fine Art Uncoated Cover for our invitations. Imprintible Run them through your ink jet, or have us imprint the cards for you. Made in USA on 125 lb. Fine Art Uncoated Cover..
Great value Save 25% per card with this 8-card party pack over our regular retail pack. Great vintage designs. Our designs, by Dolce Mia’s founder Jenny Mountjoy are what most set us apart from the crowd and make our invitations special to send and to receive. About US Since 1995 Dolce Mia Designs, a family-owned Califonia business, has been designing and manufacturing fine vintage-inspired product for the gift, stationery and bath & body markets.